In this post, I explain comparative liability in terms that anyone can understand, and explain what it means in terms of out-of pocket expense and how it affects your future insurance rates. Comparative Liability is a term that insurance companies use when both drivers in an accident have some degree of fault, but neither party is completely responsible. It should be simple enough, but confusion arises while trying to figure out how much money will come out of your pocket, and how it will affect your future rates. The easiest way to understand this type of insurance claim is to take an example, and follow it to conclusion. 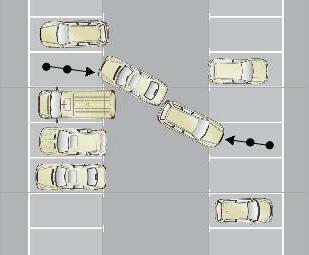 A really common example is when two people back into each other in a parking lot. First things first, there should be some agreement that there is comparative liability. 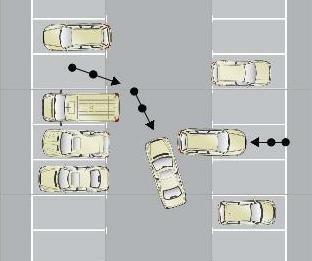 If both drivers agreed that they were both backing up and didn’t see each other, or they both thought the other driver was going to stop, and both drivers were honest and level headed, able to take responsibility for this particular mistake, and willing to admit that they were partially at fault, then this would be an easy to resolve, simple 50 / 50 accident. I’ll explain in a minute how this is resolved, but first you should know that it hardly ever goes down like this. Usually both parties think the other party is at fault, and blame the other person. Both drivers usually claim that they backed out first, and accuse the other driver of lying. Keep in mind that just because they were both backing, doesn’t mean it is automatically comparative liability, but there are usually no witnesses, and no way to prove anything. For this example, since I’m explaining comparative liability, let’s assume that neither driver can prove he has the right of way, and both drivers are equally at fault and assigned 50% of the blame. In this example both drivers’ insurance adjusters agree to settle the claim as a 50 / 50. If you went through your own insurance, you would pay a percentage of your deductible equal to your liability. So for a 50 / 50 accident you would pay 50% of your deductible. You would pay the deductible at the body shop after your car was repaired. Your own insurance would cover the other half of the deductible, as well as the entire amount of the remaining cost of repair, because collision coverage covers the cost of repair, less the deductible, regardless of who was at fault. Your insurance is going to collect the other 50% of your deductible from the other driver’s insurance. Your insurance would later send a copy of the repair estimate to the other insurance company, and be reimbursed for 50% of the repair of your car. They are simply being reimbursed for the amount of the repair that wasn’t your fault. Your insurance company will also write a check to pay for half of the other driver’s repair. 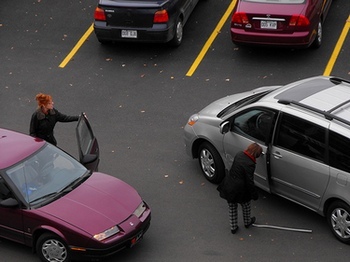 If you don’t have collision coverage, you will be forced to go through the other insurance company for your repair. Since you are going through the other insurance, there is no coverage for the percentage of the accident that was your fault. The other driver’s insurance company will estimate the cost of repair, and send you a check for 50% of the repair. Now that we have covered the very basics, there is something else you should know. You should know that the insurance adjusters do not have to agree to do comparative liability. Your insurance could call it a 50 / 50, and the other driver’s insurance could decide you were 100% at fault. The good news is that your insurance company might still pay the percentage of your deductible based on their own liability determination, independent of the other insurance company’s liability position. Your future rates are based on your insurance company’s liability determination, independent of the other insurance company’s liability determination. Typically, no matter what amount is paid on a claim, the accident will not count against you unless you were more than 50% at fault, so a 50 / 50 should not affect you negatively. Obviously I cannot speak for every insurance company, so you should verify this with your adjuster. It should also be noted that if the insurance companies do not agree on comparative liability percentages, the claim will eventually end up in arbitration. In this example, your insurance company would be arguing it was 50 / 50, and the other arguing that you were 100% at fault. If the final determination after arbitration is that you were more than 50% at fault, it may affect your record adversely. In other words, you would have an “at fault” accident on your record that could make future insurance rates higher. Hopefully this post was helpful explaining comparative liability, and how it affects your wallet. Keep in mind that if I covered every possible scenario it would be a book, not a post, but I’m happy to answer questions. If you have any questions please send me an email, or just ask your question in the comments section below. I’ll try to get back to you the same day. Another car and I hit back bumpers. They said they were stopped. But, I didn’t see them in my mirrors or my windows. They said they weren’t moving but I heard a scraping sound. I would think if it was my fault I would have heard a thud. What could the scraping sound mean? So far their insurance company is claiming I’m 100% at fault. But when my insurance company looked at the pictures of the dents in our bumpers they said it looked as if it was a 50/50. There’s no camera where we hit and no one there was paying attention so I don’t think there were any witnesses. What does this sound like? We’ll first of all, if you told the other insurance company that you didn’t see the other driver, they’re going to say it was your fault. If you back out like you’re supposed to, you have your arm around the passenger side headrest, are turned all the way around, and are looking out your back window as you’re backing. You’re not supposed to use your mirrors to back out, even though we all see people do it all the time. There’s really no valid excuse to not see someone before you make contact. I’m not trying to beat up on you, I’m just the messenger. This is the way the adjusters will see it. Keep in mind, this doesn’t mean you are at fault. The other driver probably didn’t see you either, and this probably is a 50/50, so hopefully you didn’t do a recorded statement with the other insurance company and tell them you never saw their driver. It sounds like your adjuster is looking at the impact points on the two vehicles, and is unable to say that the physical evidence shows that either driver had taken possession of the isle. (like in the illustration above. In this case it will end up in arbitration after everything is paid out (See “Disagreements” above) You’ll go through your own insurance, pay your deductible, and wait to hear back after arbitration. The “thud” versus “scrape” sound will probably not hold much weight, since the noise can also be effected by the direction of impact even if only one car was moving. Hopefully that answers your question. If not, feel free to follow-up. I was an actual insurance adjuster in my 20s, and investigated auto accident liability for about 5 years. I’ve handled thousands of cases, and theses double backing accidents almost always ended up in arbitration. If I don’t have collision and they settle my investigation at 50/50 and my car is totaled who gets my car? I know since my insurance isn’t paying anything they don’t but why should the opposing insurance get it if they are only paying me 50% in this case do I keep my car? I live and insured in California if that makes a difference. With a police report unable to conclude who is at fault will both insurances agree automatically on 50/50 resolution ..and if “yes” do I get points on my driver license record ? No. The officer is simply recording what the parties are saying. The officer was not a witness, and insurance companies will often deny claims even when the officer writes in the report that their insured was at fault. If you and the other driver agree that it’s 50/50, then you can work it out. More often what happens is both drivers say the other person was at fault, and both insurance companies just pay for 100% of their own insured’s damage, and then send the bill to the other driver’s insurance. Then they both deny the other driver’s claim, and it goes to arbitration. I’m not familiar with the current point system, since that has more to do with the state than with the insurance companies, but back when I was an adjuster, you had to be found to be more than 50% at fault for them to hold it against you and raise your rates. My Son was hit on the left rear passenger door and left rear tire on a left turn lane before the Traffic light, the lady that hit him was citated with careless driving (florida). the car is totaled, her insurance want me to settle with 50 / 50. I do not agree with their decicion… what can I do? It depends on the situation with your own insurance. If you have collision coverage, I would just go through your own insurance to get the total loss settled less your deductible. Then request the deductible from the other insurance. If they only send you half of it because of their liability position, you can file small claims court against their insured for recover the other half of the deductible. If you don’t have collision coverage then you won’t have the option of going through your own insurance. If you settle, then that’s it. You’ll never recover the difference.